Shirley Temple Black is widely regarded as an American heroine who devoted her career first to films and then to public service. The United States ambassador to Czechoslovakia from 1989 until 1992, she is still remembered by millions of fans for her success as a child movie star in the 1930s. Shirley Temple was born in Santa Monica, California, on April 23, 1928. The youngest of three children, her father was a bank teller, who later worked as his daughter's manager and financial advisor when she became famous. As a child Shirley Temple began to take dance steps almost as soon as she began to walk. Her mother began taking her to dancing classes when she was about three and a half years old. She also took her daughter on endless rounds of visits to agents, hoping to secure a show business career. The hard work soon paid off—little Shirley obtained a contract at a small film studio, and one of the great careers in film history began. Shirley Temple's first contract was with Educational Pictures Inc., for whom she worked in 1932 and 1933. She appeared in a short movie entitled Baby Burlesks, followed by a two-reeler, Frolics of Youth, that would lead to her being contracted by the Fox Film Corporation at a salary of $150 per week. The first full-length feature that she appeared in for Fox was Carolina (1934). It was another Fox release of that year that made her a star: Stand Up and Cheer. She appeared in eight other full-length films that year, including Little Miss Marker and Bright Eyes. The first of these is especially notable because it was her first starring role. In 1934 the Academy of Motion Pictures Arts and Sciences awarded her with a special miniature Oscar "in grateful recognition of her outstanding contribution to screen entertainment during the year, 1934." Through the rest of the decade Shirley Temple's star soared. It was not only her adorable dimples and fifty-six corkscrew curls that would keep her at the top of the box office listings. She was a spectacularly talented child, able to sing and dance with style and genuine feeling. Gifted with perfect pitch, she was a legendary quick study who learned her lines and dance routines much faster than her older and more experienced costars. funds, coupled with both of her parents' spending, enabled her to enjoy only a fraction of the immense fortune she had earned. By 1940 she had appeared in forty-three feature films and shorts, and an entire industry had sprung up with products celebrating the glories of Shirley Temple: dolls, dresses, coloring books, and other merchandise. By the decade's end Temple was no longer quite a child. When The Blue Bird (1940) proved unpopular at the box office, and the next film she starred in fared poorly as well, Twentieth-Century Fox devised a means of getting rid of the "property" that had saved the fledgling studio from bankruptcy. She tried to maintain her acting career through the 1940s, but never again did she come even close to the stardom of her childhood. Film audiences would simply not allow the adorable girl who had sung "On the Good Ship Lolly Pop" and "Animal Crackers (in My Soup)" to grow up. It is arguable that nothing could have been done to preserve Temple's youthful magic. Yet her ongoing struggles as an adult would prove her to be as heroic in her own life as she had ever been on the screen. A difficult first marriage to actor John Agar caused her to mature quickly. Almost immediately thereafter came the realization that her parents had been looking out for their own best interests rather than hers. In 1950 Temple married the successful California businessman Charles Black, with whom she raised her children. Her concern over domestic social problems caused her to realize that life as a private citizen could not satisfy her desire to make the world a better place. She ran for Congress in 1967 and was defeated. This was only the beginning of her involvement in public service, however. In 1969 she was appointed to serve as a representative to the United Nations (UN), a multinational organization aimed at world peace. 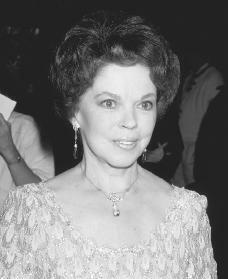 Her work at the United Nations led to a second career for Shirley Temple Black. In 1972 she was appointed representative to the UN Conference on the Human Environment and also served as a representative on the Joint Committee for the USSR-USA Environmental Treaty. The next year she served as a U.S. commissioner for the United Nations Educational, Scientific, and Cultural Organization (UNESCO). Black overcame a great challenge in 1972 when she successfully battled breast cancer. When she publicly disclosed that she had had a mastectomy (the surgical removal of a breast), she gave courage to millions of women. Two years later she was appointed ambassador to Ghana, where the people of that nation warmly received her. In all of her various diplomatic functions, Black's intelligence and spirit contributed greatly to her country's reputation and furthered its world position. Democratic President Jimmy Carter (1924–) paid tribute to her tact and flawless taste when he chose her (Black had been a lifelong Republican) to make the arrangements for his inauguration (swearing in as president) and inaugural ball in 1977. By 1981 Black was such an established pillar of the public service community that she became one of the founding members of the American Academy of Diplomacy. In 1988 she was appointed Honorary Foreign Service Officer of the United States, the only person with that rank. She went on to serve as the U.S. ambassador to Czechoslovakia (today known as the Czech Republic and Slovakia) from 1989 until 1992. Such honors are ultimately the true measure of her career's meaning. Latter-day film industry recognition such as the Life Achievement Award of the American Center of Films for Children or the full-sized Oscar that Black was given in 1985 were echoes of a past that, while still meaningful for "Shirley Temple," were not quite relevant for Shirley Temple Black. According to Black, her more than twenty-five years of social service have been just as enjoyable as her years in Hollywood. Black, through her lifetime of service in the arts and public life, has demonstrated the spirit of self-sacrifice and hard work that Americans have aspired to for generations. She is regarded as a true American heroine. Her lifetime achievements were duly honored on December 6, 2001, when she was honored in a ceremony at the Kennedy Center for the Performing Arts in Washington, D.C.
Black, Shirley Temple. Child Star: An Autobiography. New York: McGraw-Hill, 1988. Blashfield, Jean F. Shirley Temple Black: Actor and Diplomat. Chicago: Ferguson, 2000. My sister's and I are making a scrape book for our Mother's 80th birthday and wondered if there is any place to get an autographed photo of Shirley Temple Black? I would like to thank Shirley Temple Black for the very courageous stand she took during the Viet Nam war in support of our troops. Her statement that all the protests being made, all the anger being expressed against our boys only played into the hands of Communists was simple in its truth and integrity. It was not a popular stand to take and I dare say, she was probably reviled for making it. But she was right.